Mix all liquid ingredients together and pour over ice in a glass. Grate fresh nutmeg on top. Serve with a stirrer if you want to mix the nutmeg in to the drink. If you want a stronger drink it tastes great with up to 3 parts rum. Refreshing like a Pina Colada. Takes you to away to an Island beach. 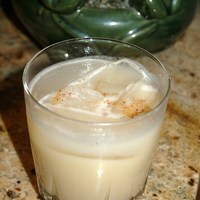 This pain killer drink recipe is fantastic! The only problem is they go down a little too smoothly! Defintely was not feeling any pain after these. Mark...where/how do you buy creme of coconut? Is it bottled like a creme de cacao? Or is it something you buy fresh? I know your question about finding creme of coconut is over 4 years old...but I just saw this. If you are still looking for it, I found it in the alcohol mixer section at Wal-Mart, of all places. Thank you, Thank you...I saw this drink recipe and decided to try it. I am not much of a drinker but this one is is good. This looks a good treat. I guess yeh, dad's would like it! Sounds like a great drink to try on Father's Day...hint, hint! Thanks for sharing!